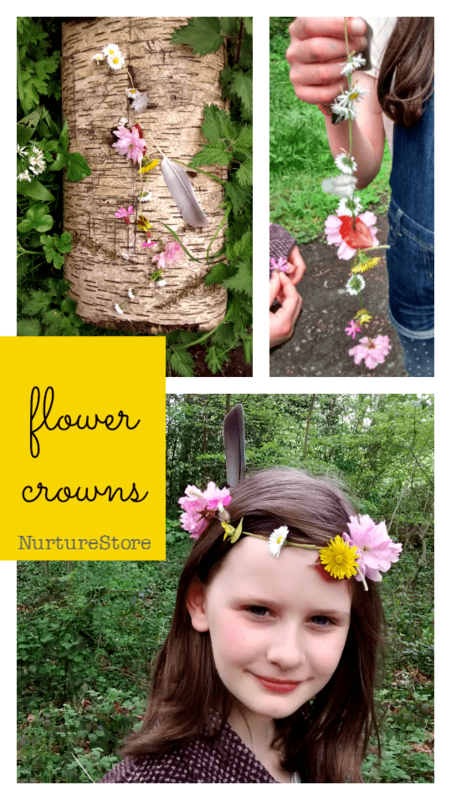 Flower crowns are a lovely nature craft and forest school activity. 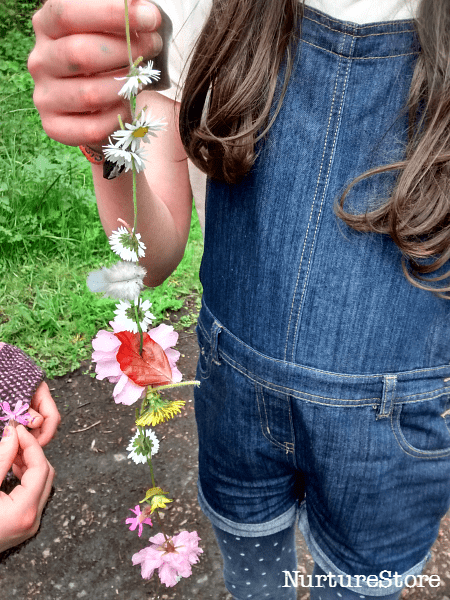 You can use them on a nature walk to explore the plants you discover along the way and tell the story of your walk through the treasures you find. Flower crowns also make a lovely spring flower craft and a great headdress for a Beltane celebration. 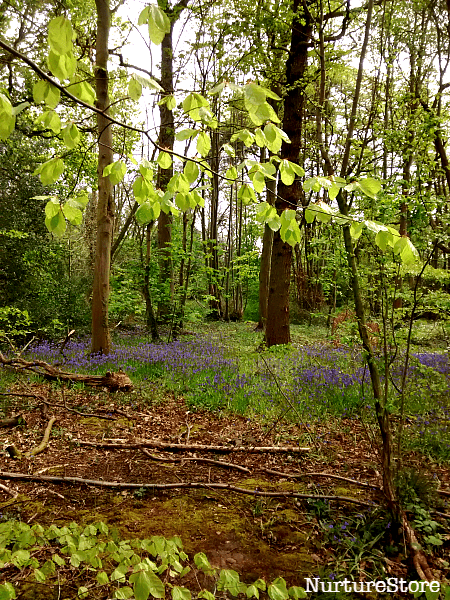 It’s beautiful in our local woods in May. We head out a couple of times a week throughout the year into the forest or along the river and we love to track the signs of the changing seasons. 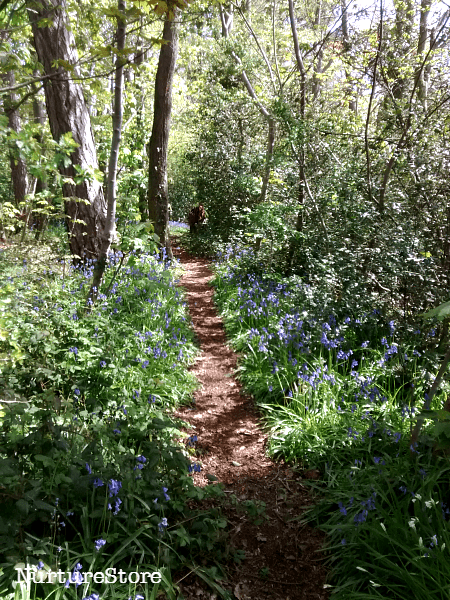 In May, for us, that means celandines, bluebells, wild garlic, dandelions, hawthorn and cherry blossom, lilac just peeping out, and the very first whispers of elderflower on the way. And it’s so noisy! The birds were in full voice this weekend, with blackbirds, sparrows, robins and crows all making themselves heard. We even saw a buzzard soaring from the woods out to the neighbouring meadows. Just beautiful, and amazing to see so much wild right on the edge of the city. 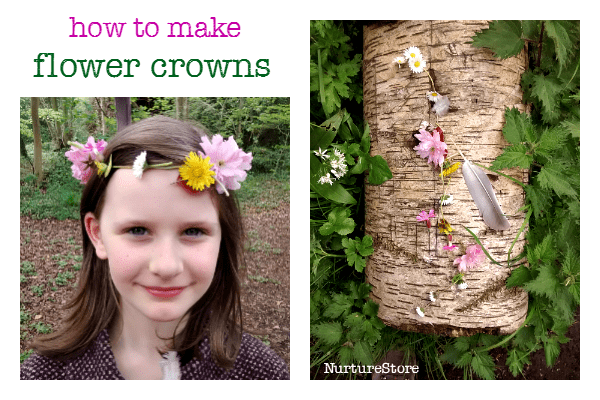 A nice way to draw children in to spotting the variety of plant life around is to make a flower crown. 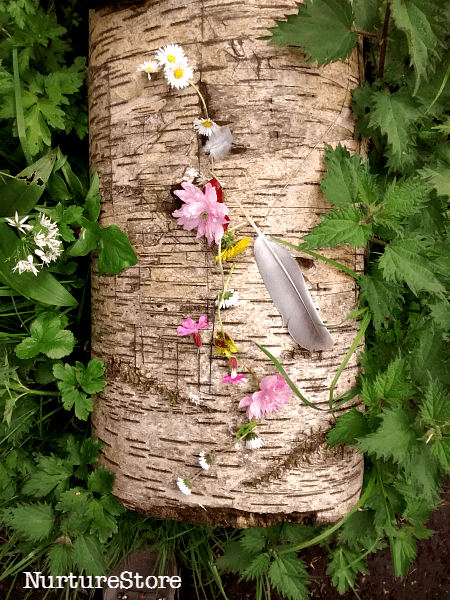 As you walk along you can gather some of the flowers you see ready to make a garland. This is a good way to introduce ideas about nature appreciation and respect. You can talk about what you might expect to see along your route, and which plants it’s OK to pick, and which to avoid. And if in doubt, you can just stick with the flowers you know well such as daisies and dandelions. If you find something new, take a photograph and look it up when you get home. Talk about how bountiful or rare the plants are, and if any are poisonous or may irritate the skin. See how they smell, and decide if you want wild garlic in your crown! 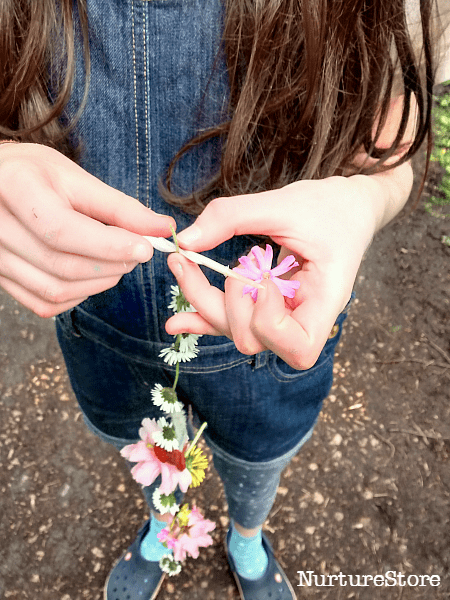 Show your children how to carefully pick one or two flower heads, making sure to leave the remaining plant intact. Build their knowledge and confidence by showing them how to spot things like nettles and bees: it’s OK to be around them, jut be cautious. Teach them that the butterflies and bees need the flowers, so only to pick a few, with care. But remember too that humans have been using the woodland for food, medicine, furniture and art materials for thousands of years. 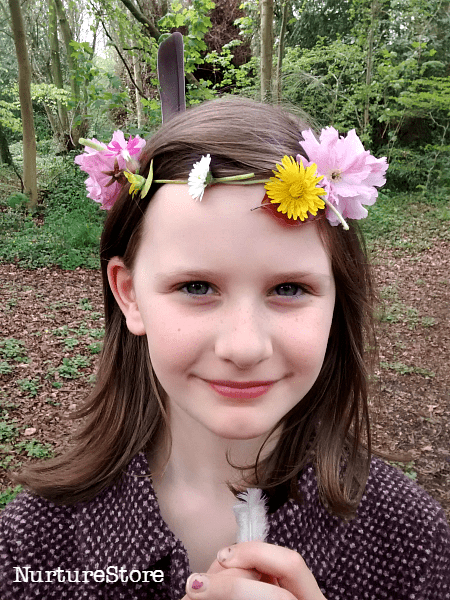 Giving your children the opportunity to interact with this heritage, to enjoy picking a carefully chosen few, can build a strong connection, respect and love for the forest. 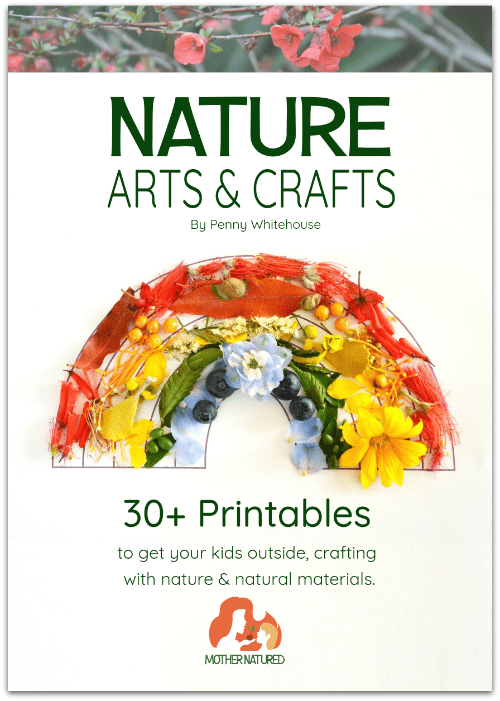 By using some of the forest you can turn your children into committed environmental stewards. Once you’ve chosen the materials to make your flower crown, thread them together like a classic daisy chain. Use your thumbnail to make a small slit in the end of your daisy and dandelion stems, and then thread the next stem through this hole. Keep going until the chain is long enough to thread around your head. You might like to add leaves and feathers too. Your chain becomes a story of all the things you have passed by on your nature walk. To fasten the crown in place, make the same kind of slit in the end of one of your stalks and this time gently squeeze a daisy or dandelion flower head through the gap. Once through, the petals will spread out and act as a ‘button’ to hold your flower crown together.